El Kuweit [Kuwait] or Kurein is situated about forty miles due south from the mouth of the Shatt al Arab (the joint waters of the rivers Euphrates and Tigris), and consequently on the Arabian coast. It is a seaport, containing from fifteen to twenty thousand inhabitants almost exclusively Arabs, and is the most northern seaport of the country, El Hassa [Al-Hasa], or El Hadjar, which territory is known also as Arabia Deserta. The climate of Kuweit is fearfully hot, the town being surrounded on the north, south, and west by the dismal desert El Dahana. So hot and barren indeed is the neighborhood of Kuweit, that with the exception of the Sheik's little garden in the courtyard of his residence, not a tree, shrub, or even blade of grass is visible either in, or out of the town as far as the eye can reach. There is no soil, nothing but glowing, drifting sand from the adjoining desert, and many of the houses most distant from the shore are buried almost to the roofs in sand drifts. But there are said to be some small oases in the desert, within thirty miles of the town, scattered here and there, like islands in the ocean; spots where grass, and bushes are growing in consequence of the presence of water, more or less abundant, and it is partly from these fertile spots, partly from Bassorah [Basra], near the mouth of the Shatt al Arab, that the Kuweities obtain their supplies of vegetable food for man and beast. From Bassorah they bring whole cargoes of rice, dates, coffee, barley, corn, straw, etc. in their bagalows. These bagalows are heavy, roughly built sail boats, carrying from fifty to two hundred and fifty tons of cargo; their hull is very broad wedge-shaped, the keel sharp, and the rudder very uncouth, being ridiculously large and clumsey. On the after part of the vessel, is a kind of a cabin, or state-room, on the top of which the helmsman stands, managing the unweildy rudder by means of a long pole fixed at one end in a horizontal position to the rudder, which serves fixed in this way as a handle or lever to the latter. The bagalow carries but one mast, standing in the middle of the craft; but this mast instead of being upright, or inclining slightly backwards, as in our American craft, stands forward at an angle of nearly sixty degrees. To the top of this mast, the large and single sail is hoisted by means of a pulley. The most striking peculiarity of the bagalow is that when loaded and under sail, her bow is only two to six feet above the water's edge, while the man at the helm stands ten or even twenty feet above the same, according to the size of the craft. Notwithstanding the singularly awkward shape of these boats, the Arabs sail exceedingly well in them, and venture out even in the roughest weather; in some of the larger ones, they make voyages as far as India, Madagascar, Mauritius, and the eastern coast of Africa. The male inhabitants of Kuweit are nearly all either merchants or sailors, trading with Bassorah, and the Persian coast, or with the wild Bedouin tribes of the desert, in the pearls, frankincense, firearms, ammunition, cloth, saddles, carpets, etc., for skins, sheep's wool, camel's hair, gum arable, coffee, dates, etc. Many of the inhabitants raise herds of sheep, horses, donkeys, goats and camels, which they rear on the oases above mentioned; their camels are celebrated throughout Arabia for their great speed and endurance, as are their snow-white donkeys also. The women of Kuweit are reputed for their industry, and skill at all sorts of handiwork such as knitting, spinning, weaving, etc., as well as for their good looks, they being considered even by the Turks and Persians, as by far the handsomest women along the Persian Gulf. On our return to the Sheik's [Abdullah II Al-Sabah, 1814-1892] residence, we found him still sitting cross-legged on the very spot where we had left him, busily engaged in giving orders to his slaves, who were making preparations to serve up dinner. The table, if I may call it so, was already laid, in the shape of an Indian straw mat of fine texture, about ten feet square, spread on the rich Persian carpet which covered the floor. Half a dozen soft pillows, covered with blue cloth, having tassels at each corner, were laid on the mat in a circle, at equal distances from each other, and intended as seats for the guests. Before each pillow lay a little yellow straw mat, perfectly round, about two feet in diameter, and as finely knit as a Panama hat. In the middle of each of these mats, stood a kind of heavy silver bowel, empty as yet, and on each side of it was a silver goblet, one containing water, the other sour milk called Laban [labneh, strained yoghurt] by the Arabs, but from what animal it came, or where the Sheik got it, I was at a loss to know, for we had seen neither cow, sheep, mare or female camel in the whole town. We were afterwards told that it was milk of camels or dromedaries, which are kept in large numbers by the Kuweities on one of the above mentioned oases in th« desert, and the milk had been brought to town on the back of one of the animals in a bag made of goat skin, the usual implement for carrying water, milk, oil, butter, etc., in Arabia. But what struck me most forcibly in the arrangement of the dinner table was a beautiful set of silver cutlery of European manufacture, evidently perfectly new, having as we afterwards learned been brought from Bombay by the Arab merchant. We were naturally anxious to see the Sheik, and his enterprising nephew handle for the first time in their lives these implements of civilized gastronomy. Dinner was served in superb style, the slaves bring in an immense variety of dishes, consisting of boiled goat's flesh, a lamb roasted whole, roasted camel's meat, chicken, three varieties of fish, and pellauw (a dish composed of cooked rice, butter, onions sliced, almonds, raisins and roast chicken, which forms the national dish of Arabia, and is somewhat similar to a dish, common in the northern part of Africa, called Kusskussoo [couscous]). Besides these dishes, there was a profuse supply of vegetables, and fruit indigenous to Arabia, but brought from Bassorah. The whole dinner was indeed worthy of a chef de cuisine. The bread, which was served to us at the table, was good, baked in the shape of a pancake, and made of corn, ground with the common Eastern hand-mill, which is composed of two round flat stones, resembling two grindstones, lying horizontally upon each other. The upper stone turns round on a swivel in the centre, when moved by means of a wooden handle fixed vertically into the stone near the edge. Through a hole, also in the upper stone, the corn is made to fall between the two flat stones, and is there crushed and ground by the pressure and friction of the upper stone on the lower one, and ejected in the shape of coarse flour. I need hardly say it is the most primitive mill known, and had probably already been in use in the time of Abraham. There was also abundance of butter and cheese; the former however was not very good, having a strong disagreeable taste, it was made from the milk of sheep. The cheese called chibben by the natives, was greenish white of good taste and made of goat's and sheep milk. I fear our appetites must have appeared very vulgar to our host and his relative; at all events they ate very sparingly, and chiefly of vegetables, the natives of Arabia being very abstinent, and preferring vegetable to animal food. Dinner being ended we resumed our pipes, coffee and sherbet, which were served as before. By this time the day was far advanced and the sun fast disappearing in the West, compelling our host to beg leave to preform his prayer and ablutions. During his absence, we conversed about our day's interesting experience. On his return, he invited us to ac company him to the flat roof of the house, whicL throughout Arabia is the usual place of promenade, it being by far the best place to enjoy the evening breeze. The roof also serves as dormitory for the inhabitants, who are compelled by the excessive heat of the atmosphere to sleep on the top of these houses, the only place open to the fresh air and comparatively free from dust and vermin. The bedding is carried into the house in the morning, and placed on the roof again shortly before sunset. Our host had provided us with silken couches, on which, fanned all night by the gentle sea-breeze, we slept so soundly that the Sheik was obliged to waken us in the morning, for fear that the powerful rays of the rising sun might fall on our faces ere we rose—a thing much dreaded by all the Arabs, as it invariably causes intense headache to the inconsiderate sleeper. Looking round, we saw the jolly-boat from the steamer already waiting for us at the beach, which hastened our departure. After cordially thanking our host for his sumptuous hospitality, which brought a beam of sunshine over his stern and swarthy face, the Captain promised to use all his powers of persuasion to cause Kuweit henceforth to be made a regular place of calling for the Company's steamers, which promise visibly brightened the usually serious countenance of our host still more than our eulogies of his unlimited hospitality, as the latter is a virtue pertaining to every Arab, however poor he may be. There is scarcely a doubt, though, that our host expected to hear this remark from the Captain, which circumstance had no small weight in the more than ordinary cordiality of our entertainment. The Sheik accompanied us to the beach, and his last words were an apology for not saluting us on our departure, owing to a fear that after the disastrous effects caused by an explosion of one of his guns in saluting us on our arrival, the two that remained might meet with a similar fate if put to the test again. The imminent peril to which his men might be exposed by a second discharge of the guns, seemed to be a secondary consideration with him—quite a business-like view of things we thought. After we arrived on board once more, the captain ordered a parting salute of three guns to be fired, and we steamed out of the harbor, the Sheik as a matter of politeness remaining on the beach surrounded by his people, till we had disappeared from his sight. Britain oversaw foreign relations and defense for the ruling Kuwaiti AL-SABAH dynasty from 1899 until independence in 1961. Kuwait spent more than $5 billion to repair oil infrastructure damaged during 1990-91. WHERE will the Bagdad Railway [Berlin-Baghdad Railway] end? That is the chief question the war will decide, so far as German Weltpolitik [world policy] is concerned. Before the war, Berlin, by long and determined negotiations, induced Constantinople and London to allow the extension of the railroad to Busrah [Basra], the port of Mesopotamia, on the Shatt Al Arab, the Arab River, sixty miles from the Persian Gulf. 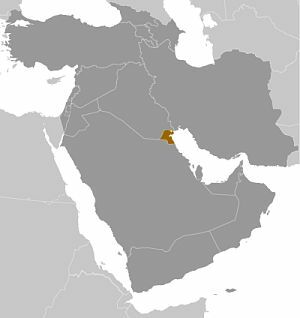 If Germany determines the terms of peace after the present war, there is no doubt that the Bagdadbahn will have its terminus at Kuweit [Kuwait], 100 miles south of Busrah and right on the Persian Gulf. That would give Germany a base from which, in the next war, she could seize India from the British. In November, 1899, the Kaiser [Wilhelm II, 1859-1941] got his concession for the Bagdad Railway from the Turkish Sultan, Abdul Hamid [Abdul Hamid II, 1842—1918]. In 1900 he tried to get a concession for the terminus of that railway at Kuweit from Sheik Mubarak [Mubarak Al-Sabah, 1837-1915], the ruler of that town. He was one year too late. In January of 1899 Sheik Mubarak had cast in his lot with the British. He had agreed to follow their advice in all his dealings with foreigners. In return they gave him their protection. He needed it, for in 1901 a Turkish corvette came to Kuweit to carry him off to Constantinople. A British warship arrived just then and drove the Turks away. When the Germans came to lease twenty square miles of his land, Sheik Mubarak refused to have anything to do with them. It was because Sheik Mubarak so effectually blocked the German plans for a port on the gulf that the British were able to hold up the full development of German ambitions in the Orient. In is only in the light of these facts that the importance of the approaching battle of Bagdad [Baghdad] can be appreciated. The Germans will have to help the Turks to drive the British from the whole Mesopotamian valley before they will be able to get by war what they could not gain by negotiation. That they are determined to succeed there is evident. One of the first measures introduced into the present Turkish Parliament was a bill for a loan of £T2,112,000 ($10,000,000) to be raised in Germany for the completion of the Bagdad Railway. Now one of the chief characters in this Near East drama has passed away. Sheik Mubarak has died at Kuweit. Whether this introduces any new element into the situation remains to be seen. But the Germans will probably have no more success in dealing with Sheik Jabir [Jaber II Al-Sabah, 1860—1917], the son and successor, than they had with Sheik Mubarak himself. The latter was nearly 80 years old, and the British, in their treaties with him, planned for his heir as well as himself. Sheik Mubarak was a most interesting personality. He was a typical Oriental ruler. In many ways he reminded one of Haroun al-Raschid [Harun al-Rashid, 763—809]. In all his dealings with the British, however completely he was guided by them in his foreign relations, he never allowed them to interfere in the least in his domestic affairs. He was absolutely independent, as far as his own subjects were concerned. He showed his power in ways that Western rulers use only in times of war. The result was that he was known as a "strong" governor. But as only evildoers had to fear his punishment, his dominion prospered. Life and property were so safe that Kuweit imitated America in attracting immigrants from Turkey, Persia, and other places where disturbances were too frequent for business prosperity. During the twenty years of Mubarak's reign, Kuweit's population continually increased until it now numbers 50,000 persons. It was always hard to find an empty house in the town, although new ones were constantly being built. Some months before his death Sheik Mubarak received the decoration of K. C. S. I., (Knight Commander of the Star of India.) On that occasion Lord Hardinge of Penshurst, then Viceroy of India, made a formal visit to Kuweit while on his way to Busrah, which had been captured from the Turks. The form of address had some significant elements that showed that the position of Kuweit was no longer anomalous, nominally Turkish but practically British. Lord Hardinge, in making the presentation, said: "This is a token of regard from the King-Emperor in grateful recognition of your loyal co-operation and efforts to preserve order and quiet in his dominions." Kuweit is now in the India postal system, to show that it is a British protectorate. But it has its own flag, with the word Al Kuweit in Arabic in white on a red field, to show that it is independent. Mubarak's dominion included the town of Kuweit itself and about 100 miles of territory to the south and west and fifty miles to the north. His influence extended much further. Partly because of his age, always a matter of regard among the Arabs, and partly because of the strategic position of his town as the best harbor on the gulf and the seaport for Central Arabia, he maintained a strong place in the politics of all the Arab tribes from Mecca in the west to Ahwaz [Ahvaz] in Persia, and from Nasaria on the Euphrates to Katif [Qatif] in El Hassa [Al-Hasa]. He aided his friend Sheik Khazal [Sheikh Khaz%27al] in subduing the rebellious Bakhtiari Arabs in Western Persia, and he induced Abd al Aziz, the Emir of Nejd [King Abdul Aziz Al Saud, King of Saudi Arabia, 1876-1953], to acknowledge the nominal suzerainty of the Sultan over El Hassa. His native counsel will be missed and his influence over the Arabs will be longed for in settling the affairs of that increasingly important part of the world. Sheik Mubarak was practically illiterate. He could read nothing but the handwriting of his own secretaries. But it would be a great mistake to infer that he was ignorant. While ability to read and write would have been invaluable to him, still he was wise beyond the fathoming of his few educated subjects. Nor would a Westerner, after a conversation with him, think of calling him unenlightened and uninteresting. His portrait shows the shrewd, strong character of the man. When Mubarak came to the throne, on the death of his father and older brother, Kuweit was an Arab town out of contact with the world and untouched by modern influence. Not a white man lived in the place. But the new Sheik encouraged ships to come there. He welcomed a British political agent. He invited American missionaries to establish a dispensary and bookstore there. He introduced the first telephone, automobile, and electric light in the town. Old as he was, he was more progressive than most of his subjects cared to be. He modernized his kingdom as rapidly as he could. It is to be hoped that his successor will follow in his father's footsteps. If the Germans win the war, the town will be Europeanized in short order, whether the present ruler desires it or not. Iraq's rulers have always coveted the desert sheikdom of Kuwait, currently the richest country per acre and per capita in the Middle East. But nobody ever took the claim seriously until General Abdul Karim Kassem [Abd al-Karim Qasim, 1914—1963], the "sole leader" of Iraq, announced during the course of a three-hour long tirade that he was bent upon "liberating" Kuwait and returning it to the Iraqi "homeland". Upon hearing the news, Britain dispatched two frigates and the aircraft carrier Bulwark to Kuwait, unloaded Centurion tanks and 600 Marine commandos. Sea of Oil. Both Britain and Iraq had their minds on oil. 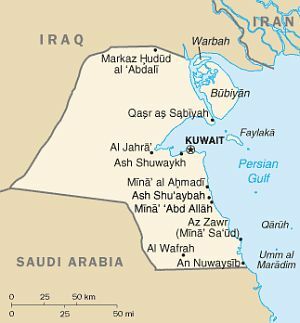 Connecticut-sized Kuwait sits on a sea of i—a quarter of the world's proven reserves and half again the U.S. reserves—though the British did not know that back in 1899, when the ruling Sheik [Mubarak Al-Sabah, 1837-1915] asked them to take Kuwait under their protective wing. The motive at the time was to stop the pro-German Ottoman Empire from expanding southward along the Gulf. But in 1938, the Kuwait Oil Company (jointly owned by Gulf Oil and British Petroleum), drilling down through Kuwait's sands, hit what proved to be the biggest pool. Kuwait now sells $500 million worth of petroleum a year, supplies 37.5% of the British market. Though his propaganda built up to a frenzied pitch, Karim Kassem blandly denied that he had any intention of attacking Kuwait... So far [the "annexation"] had cost not a penny or a life, and could serve as a popular rallying cry for months or years to come. But as a precaution, the British alerted 8,000 troops in Kenya, Aden, and Bahrein [Bahrain]. "If we were dealing with a more rational man," said one British official, "we wouldn't have to worry. But Kassem is highly unpredictable, and we can afford to take no chances."